One of the key strategies used by Certified Staging Professionals is to give prospective buyers an immediate emotional response and connection to the home. We look at demographic data, recent buying and selling statistics for the neighborhood, and culture and lifestyle trends for the area. Then we look at the home itself and envision how the most likely buyers would live in it. This personalized approach is key, and in neighborhoods that are attracting young and growing families, it is perhaps most important in “family room” spaces. Today, we’re going to look at a family room in a St. Louis home that we recently staged, and the thought process that went into the changes we implemented. 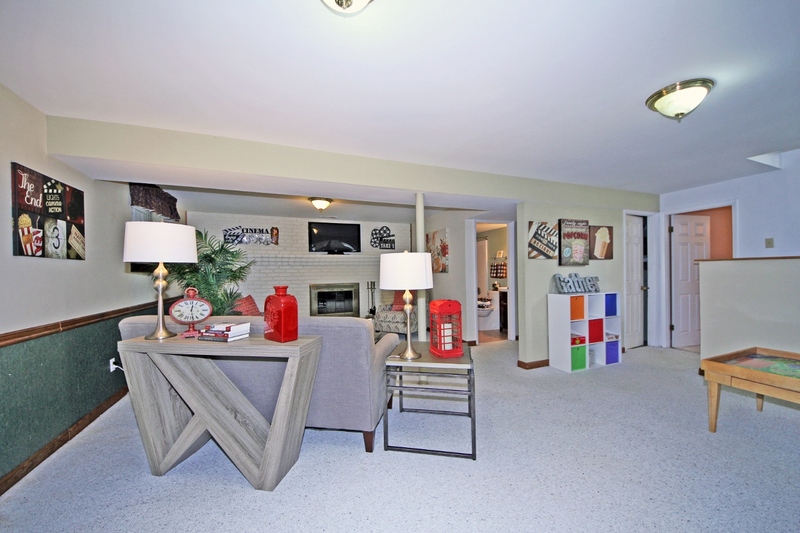 This lower level “family room” in a split level home presented quite a challenge! Not only was it unusually long (22 x 15 – to put this into perspective, the average family room is about 14 x 20!) 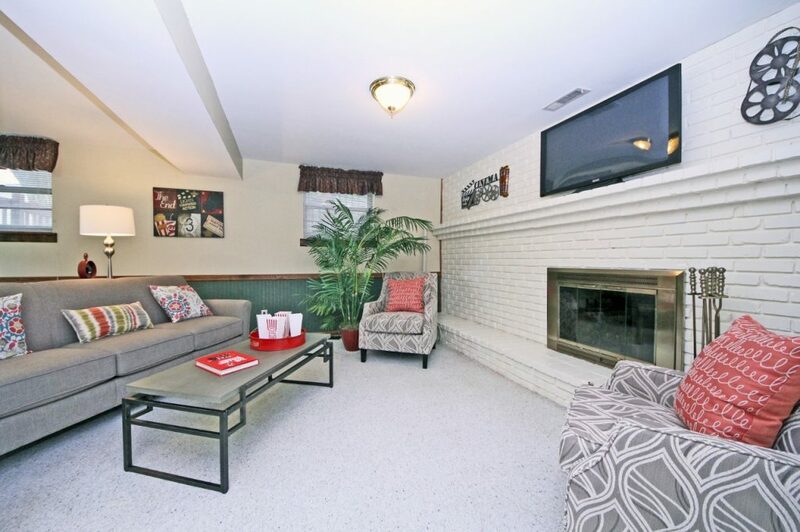 one of the 15’ walls also included an off-center fireplace and was completely bricked over. To further complicate things, there was a support pole in the middle of the room, and a very visible sump pump had been installed on the floor in the left corner of the brick wall. In terms of offering first impressions, this room wasn’t doing much to please the eye! The walls also included an outdated chair rail and paint color that we advised the homeowner to remove (the chair rail) and update (the paint color), but they had depleted their limited budget on kitchen upgrades. Staging this family room would definitely require some creative thought! We set out to create an environment that immediately captured prospects’ imaginations and thus diverted their attention away from the flaws. Because the house and neighborhood would definitely attract young families, we chose a “movie time” theme and staged the room as a fun, comfortable place for family time. We first placed a TV above the fireplace and then flanked it with themed artwork that balanced the off-center fireplace. A neutral colored couch with colorful pillows was placed next to the support pole and angled toward the fireplace and television (the focal points) to minimize the pole’s appearance. Two modern-patterned chairs filled out the seating areas, one of them strategically placed (with a tall plant) to hide the sump pump. We then utilized movie-themed art, books, and other décor items throughout the room to complete our theme and make the space thoroughly enticing. In the opposite end of the room we created a play space that had something for younger kids – a book rack and reading chairs for elementary aged kids, a train table and toys for pre-schoolers, and a study-area/craft desk for all ages. Truely a space for the entire family to enjoy. With this solution, we helped minimize the room’s flaws and at the same time created the narrative that potential home buyers could immediately connect with themselves doing! Despite some tough endeavors (the seller did not have the budget to update their older bathrooms, and the property was lacking garage space) this home ended up selling in just 8 days! This is truly a great example of how staging your house can help it sell faster. Staging a Family Room Doesn’t Have to Be an Impossible Challenge – Let Us Help! If you’re selling your home and working with a problem room that could use a make-over, we can help. Contact us to set up a consultation and discover the best strategies for staging your property and making it more enticing for potential buyers!